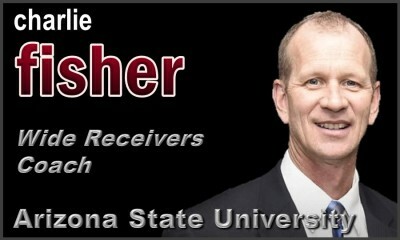 Coach Fisher was named Wide Receivers Coach and Passing Game Coordinator at Arizona State in January 4, 2018. He joined former colleague Rob Likens who is the new Offensive Coordinator, the two coached together previously at Temple. In his first season in the desert, Charlie helped the Sun Devils win 7 games and earn a spot in the Las Vegas Bowl. He also helped with the progression of anticipated first round WR, N'Keal Harry, who finished the season with 1,088 yards and 9 TD's. Prior to ASU, Charlie was the head coach at Western Illinois University (FCS) in Macomb, IL. In just two seasons at the helm of the Leathernecks, Charlie has his program solidly entrenched among the top 10 in the nation, and has earned a nomination for the prestigious Eddie Robinson Coach of the Year Award in 2017. Entering the 2017 FCS playoffs, his team won 6 games on the road, three of which were against ranked opponents, and beat an FBS school on the road for the second straight year. The Leathernecks look to take the next step and “Finish This Fight” (program’s motto started during the off-season). The Leathernecks jumped out to a 3-0 start during the 2016 season, winning all three non-conference games, including a 28-23 FBS win at Northern Illinois - the program’s first since 2003 - and got off to a 6-2 mark. Western jumped to as high as seventh in the national rankings in 2016. Two players were named All-American under Fisher, wide receiver Lance Lenoir, Jr. (all-time leading receiver in WIU history and most catches in MVFC history) and linebacker Brett Taylor, who finished seventh in the Buck Buchanan Award voting. Lenoir also signed as a free agent following the 2016 season with the Dallas Cowboys. 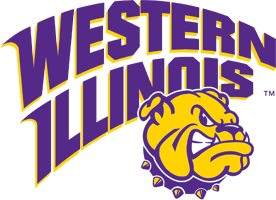 Fisher became the 28th head football coach in WIU history. He spent the previous two years at Richmond, taking over as the offensive coordinator in 2015 after serving as the wide receivers coach and director of recruiting in 2014. In 2015, the Spiders advanced to the semifinals of the FCS playoffs (10-4 overall record) while earning a 'Top 10' national ranking. During the 2015 season, Richmond featured a balanced offensive attack, ranking 19th nationally in total offense (451.9), 31st in rushing (190.9), 27th in passing (260.9), 14th in passing efficiency (145.41), 23rd in scoring (33.0 ppg), eighth in third down conversions (47.4), 18th in time of possession (32:31) and 19th in redzone offense (.855). "I am honored and humbled to be named the head football coach at Western Illinois University," said Fisher. "This team has a great foundation and a really good nucleus of talent returning. I'm excited to keep building this program as a contender in the Missouri Valley Football Conference, continue on the great tradition of winning football and being part of a great community." The Spiders scored 37 or more points in half of their 14 games, including wins at James Madison (59-49) as part of the ESPN College GameDay event and at Illinois State (39-27) in the quarterfinals of the FCS Playoffs. Six offensive players earned All-Colonial Athletic Association honors (including three offensive players named All-American), and first year quarterback Kyle Lauletta threw for the second-most passing yards in a season. Richmond won nine games in 2014 and also advanced to the second round of the Playoffs. That season the Spiders ranked eighth in the country in passing offense, were second in conversions on third down and fourth down. "Coach Fisher has the ability, experience and energy to lead Leatherneck Football. He's a proven winner at all levels of the college game, and will bring out the best in our student-athletes," said Tanney. "Most importantly, he's a great fit for Western Illinois University. We're excited to welcome him and his wife, Julie, to Macomb." Western Illinois becomes the second head coaching stop for Fisher. From 1993-97 he was the head coach at West Georgia and posted a 36-17 record with a share of the 1997 Gulf South Conference championship and two postseason appearances. He coached 45 All-Gulf South Conference performers and seven All-Americans. With more than 30 years of college coaching experience, Fisher has spent time as an assistant coach at: Penn State, Miami (Ohio), Vanderbilt, Temple, North Carolina State, West Georgia, Lenoir-Rhyne, Ole Miss and Eastern Kentucky. He was a graduate assistant on the 1982 Eastern Kentucky team that won the FCS national championship. During his two years at Penn State, Fisher coached true-freshman quarterback Christian Hackenberg to five Big Ten Conference 'Freshman of the Week' awards and the 2013 'Freshman of the Year' accolade. Hackenberg had the third-most passing yards in the country by a true-freshman. The year before quarterback Matt McGloin led the Big Ten in total offense, passing yards, passing TDs and fewest interceptions. In 2011 while at Miami (Ohio), Fisher served as the passing game coordinator and quarterbacks coach. He mentored Zac Dysert to the nation's 11th-best passing offense and 14th nationally in total offense. Dysert increased his passing yards by 1,100 from one year to the next and threw for 25 TDs (12 more than the year prior). Fisher spent nine years at Vanderbilt in various roles, including the co-passing game coordinator for the final five seasons. During the 2005 season he was part of the offensive staff that coached SEC 'Player of the Year' Jay Cutler. Fisher also coached wide receiver Earl Bennett, who was a semifinalist for the Fred Biletnikoff Award (nation's best wide receiver). During his time, he coached two SEC 'Freshman of the Year' award winners. The 2008 Commodores squad won their first Bowl game in 26 years. While at Temple as the offensive coordinator and quarterbacks coach, the Owls recorded the most wins and second-most points in 10 years. In his two years as the wide receivers coach at North Carolina State, Fisher coached the ACC 'Rookie of the Year' (and eventual ninth overall pick in the NFL Draft) Koren Robinson, and 1998 consensus First Team All-American and ACC 'Player of the Year' Torry Holt. Received his master's degree in sports management from Eastern Kentucky in 1984, and his bachelor's degree in physical education from Springfield College in 1980. Born July 18, 1959, Fisher is married to wife Julie and has two sons, Brett and Brian.